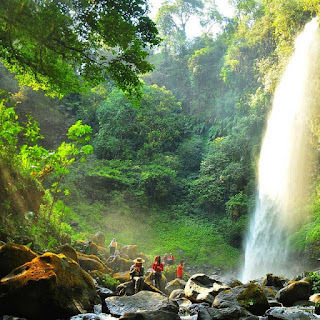 Lider Waterfall is one of the natural Waterfall in Banyuwangi that Located on the slopes of the Raung Volcano. The Lider Waterfall almost have similar high with Madakaripura Waterfall Mt Bromo with elevation 60 meters. This is the highest waterfall in Banyuwangi . Sprinkling water that bounces and exposed to sunlight will bring up the colorful rainbow make more stunning scenery. According Geographic, Lider Waterfall located in Sragi hamlet, Sumber Arum village of Songgon subdistrict about 45 KM from Banyuwangi city. Air Terjun Lider located in hidden place and being in the wilderness make its atmosphere very fresh and cool. To reach The Lider Waterfall, You must cross an extreme route, After you reach the parking lot under Bringin trees, You have to walk up to the Lider waterfall. The road is not smooth and flat descend down the hill to the river. Afteward, You have to cross the river and pass through the jungle, Continue cross the river again as much as 7 times. If you are lucky you will see local animals such as monkeys, birds , butterflies and other animals. Before arrive the location, You will find a small falls on the left road. If you already find the Lider waterfall means that almost get the Lider Waterfall location. During the trip, You will find some leaves covered by sand because the eruption of Mount Raung, But it is normally has clear due to the rain cleaned it. If your location in Banyuwangi, You can take the route through Songgon . The distance is about 45 KM from Banyuwangi city, then towards to Sumberarum Sragi, arrive in 4 arum source, turn right and follow the small road, You will meet local farmers were harvesting cloves. If you are from Jember, You should take through Genteng towards Sempu about 7 KM , after that you must pass through the Jambewangi village of Sumber Arum within about 7 KM then reach to Lider Waterfall. Beside Lider Waterfall Banyuwangi, We also provided the most popular Waterfall around Malang named Tumpak Sewu Waterfall, If You have more time, You can try Tumpak Sewu Waterfall tour and other tourism in Banyuwangi will found such as Pulau Merah Beach or Red Island Coast, You can also enjoy an active volcano in Java Island, Indonesia Such as Ijen Crater and Mount Bromo. On Ijen volcano, You will able enjoy Blue Flame Ijen Volcano that always appears all night and need 1,5 trekking from parking lot (Paltuding), this Ijen Crater located in between Banyuwangi and Bondowoso district, the nearest way is from Banyuwangi Port and possible from Bali Island or Surabaya Airport. Before enjoy your holiday to the Lider waterfall around Banyuwangi, You can try your vacation to spend your time in various nature tourism, Below is the combination tour package may you like to find. If you need more information about Mount Bromo Tour Package, You can request Our partner about Mt Bromo Tour Price, Facility and Accommodation, We will open Our service within 24 hours for your satisfaction, Detailly, You visit Our Contact.